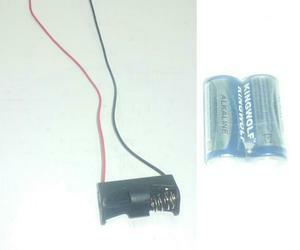 Includes: (2) 12 VOLT batteries and (1) 12 VOLT battery holder/harness to direct wire to your BlingZ LED modules. Can run up to (5) BlingZ LED modules on (1) 12 VOLT battery the extra battery is a spare. If you prefer you can add a toggle switch (not included) between your battery and LED modules. 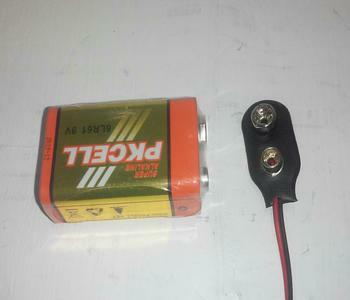 This "power pack" is best suited for smaller applications such as SKATEBOARDS, BICYCLES, COOLERS, RAZOR SCOOTERS, etc. This is a great portable power solution for anything that does not have its own 12 volt DC battery power source. 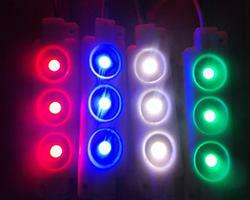 BlingZ LED modules can run on 9 - 12 volt DC power sources. To install battery holder simply use double sided adhesive tape and mount it out of the way to keep it as dry as possible. We recommend 3M double sided adhesive tape, or if you prefer you can use a Velcro tape with adhesive on one side which allows for easy removal and replacement of batteries. If you have any questions you can always email or call us through the CONTACT US tab. Includes: (2) 9 VOLT batteries and (1) 9 VOLT battery wiring harness to direct wire to your BlingZ LED modules. Can run up to (20) BlingZ LED modules on (1) 9 VOLT battery the extra battery is a spare. If you prefer you can add a toggle switch (not included) between your battery and LED modules. This is a great portable power solution for anything that does not have its own 12 volt DC battery power source. BlingZ LED modules can run on 9 - 12 volt DC power sources. To install battery simply use double sided adhesive tape and mount it out of the way, underneath the top of your kayak to keep it as dry as possible. We recommend 3M double sided adhesive tape, or if you prefer you can use a Velcro tape with adhesive on one side which allows for easy removal and replacement of batteries. For a more permanent and durable installation we recommend using a screw mounted metal or fabric battery bracket. And remember to make all connections solid and waterproof for performance and reliability, solder connections and cover using shrink tubing is the best method. If you have any questions you can always email or call us through the CONTACT US tab. 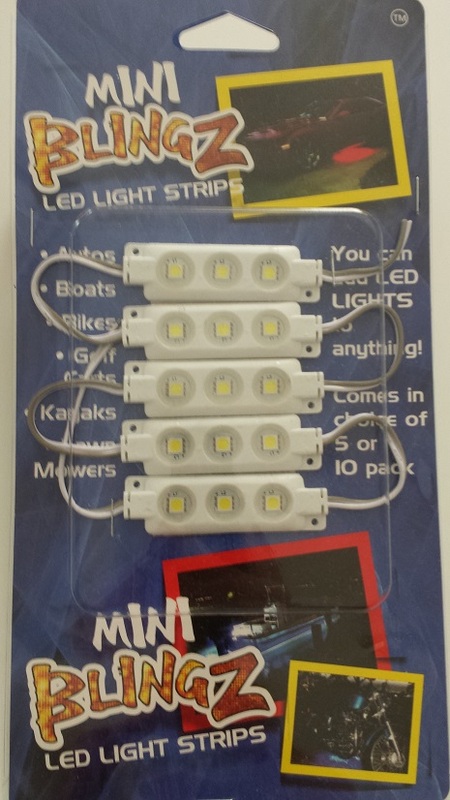 Ultimate Gig Lights BULK pack includes (20) LED modules per pack approximately 9.5 linear feet of lighting, perfect for larger projects including boats, for example inside your boat as courtesy lighting. BlingZ work great on ATVs, kayaks, jet skis, paddle boards, cars, trucks, golf carts, motorcycles, landscape projects, walkways, hardscapes, outdoor kitchens, etc. ANYWHERE you want to add LED accent lighting, these lights will work and are affordable. They come in red, white, blue and green and use 12 VOLT DC to operate just specify your color when ordering. Use our compact 12 VOLT DC battery to power your modules, you can find the battery under accessories. If you use (5) modules or less a simple 9 VOLT battery can be used to power the modules, make sure all connections are solid and waterproof for better performance and reliability. If you want multiple colors please create a separate order for each color. You can also use our converter to use Mini-BlingZ inside your home where 110 volt AC can be converted into 12 volt DC, great for under kitchen cabinet lighting, curio cabinets, breakfast bars, tiki bars, etc. for large projects up to 150 BlingZ LED modules use (1) converter. Add converters as needed, find them under accessories. 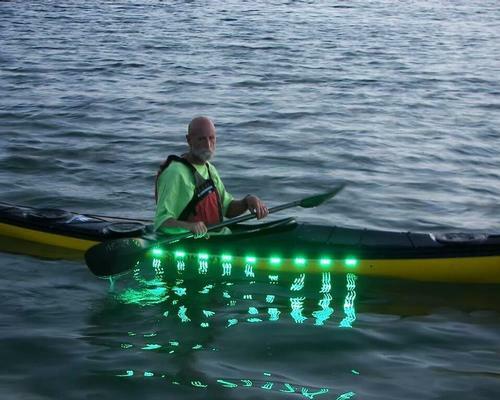 Our Kayak deluxe kit includes: (2) Navigation lights-(1)red,(1)green, (4) Interior LED modules (white), (14) Exterior LED modules (you choose color below)- TOTAL (20) LED modules included in kit. This MINI-BlingZ LED Kayak kit includes everything you need to light up your kayak, all you need is a separate power source (our compact 12 volt AGM rechargeable battery is perfect and can be purchased separately under the accessories tab) Some assembly is required, all kits include double sided 3M adhesive tape, for a permanent installation we recommend using marine adhesive or small screws for a durable mount. 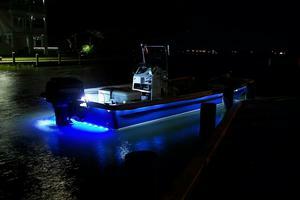 Now fishing at night can be both safe and functional using our Kayak LED kit! 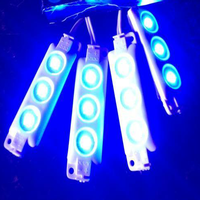 Our Kayak interior light kit includes: (4) LED modules (choose color below), (1) 9 volt enclosed battery holder w/ switch, (1) 9 volt battery - all kits come with double sided 3M adhesive. For a more permanent mounting you can use small screws or marine adhesive for a durable bond. This LED kit provides the night time angler with a source of light to aid in tying hooks, locating the right tackle, rigging baits, anything you may need a little extra light for this kit will do the trick. Our Kayak LED navigation light kit includes: (1) 9 VOLT battery, (1) 9 VOLT enclosed battery holder, (1) Red LED module - (3) LED emitters per module, (1) Green LED module - (3) LED emitters per module. Our navigation kit is a simple and easy way to add navigation lights to your kayak or canoe in cases where nav lights are required to be on the water at night.